Life as a worker ant is hard enough as it is. But carpenter ants foraging for food in the rainforest must deal with an additional threat: a parasitic fungus that takes over their body and controls their every move. Two particularly fine examples of the genre have stood out to me, namely Naughty Dog’s beautiful and moving survival-horror game The Last of Us, and M. R. Carey’s 2014 novel The Girl with all the Gifts. These stories share a grisly premise, which has its roots, at least, in a real biological phenomenon. Both are set in a dystopian near future, in which the human race is being attacked by the parasitic Cordyceps fungus. This grows within a host’s body and takes control of their behaviour, turning them into a violent, cannibalistic monster. The fungus continues growing and sprouting from the body, until it explodes, releasing spores which you would definitely not want to inhale. This might sound fanciful, but for rainforest-dwelling carpenter ants, the threat of parasitic, mind-controlling fungi is very much real. As the ants go out foraging for food, they can become infected by spores of Ophiocordyceps unilateralis fungus. Once these spores attach onto an ant, they germinate and penetrate into its body, where they continue to grow. But it’s not enough to simply feed off the ant’s body from within – this fungus needs a way to reproduce. To do this, it takes complete control over the ant’s behaviour. 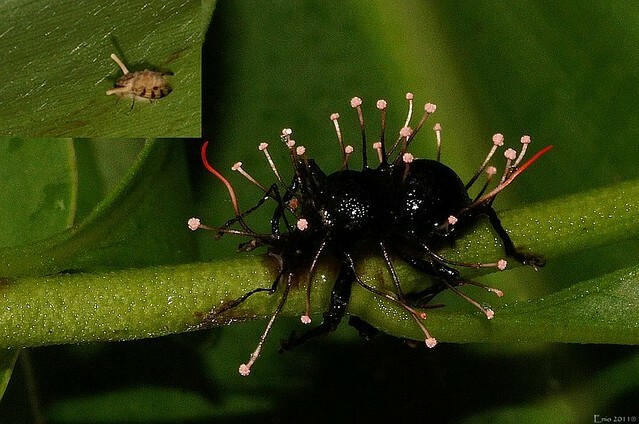 Under the influence of the fungus, the ant leaves its nest and walks up the plants and trees nearby, before reaching its final resting place on the underside of a leaf. Here it clamps its mandibles into one of the leaf’s veins, where it remains, slowly dying over the next few hours. But the fungus continues to grow long after the ant has died. Slowly but surely, a stalk emerges out of the head of the ant, which is still locked into place on the leaf. This stalk releases spores which fall down through the vegetation below, waiting for the next unsuspecting ant to cross their path. It’s not just carpenter ants that are in danger of being infected by parasitic fungi: other species of ants, as well as other insects and spiders, can be attacked by Ophiocordyceps and Cordyceps fungi. But the way in which O. unilateralis exerts such specific control over the carpenter ant’s behaviour makes it fascinating to a neuroscientist. What could be going on in its brain as the ant climbs up and latches onto a leaf with that final “death grip”? As it turns out, no-one really knows right now. But that doesn’t mean they’re not trying to find out. 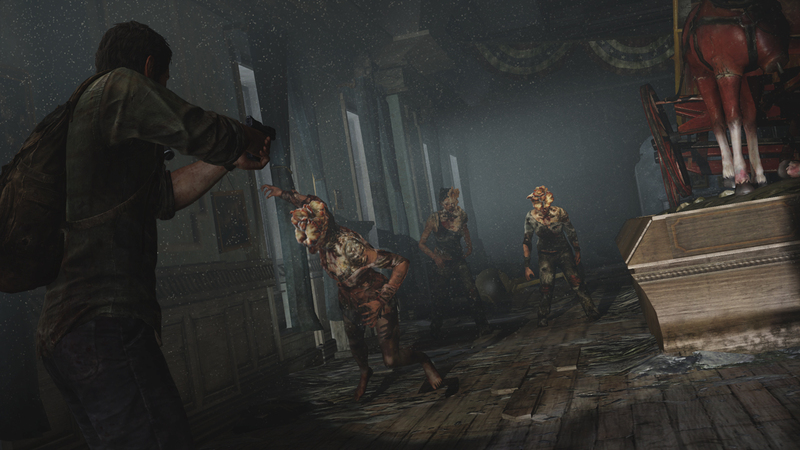 Much of the work studying the behaviour of ants infected by O. unilateralis has been carried out by Hughes and his lab at Penn State (in fact, Hughes actually worked as a consultant during the development of The Last of Us). The lab is now turning its attention to the physiology of the parasite-host relationship. Charissa de Bekker is a post-doc in the Hughes Lab, and has recently begun a crowd-funded study looking at gene expression in infected ants and fungus, in order to find out exactly how O. unilateralis is able to control the ants. de Bekker collects the heads of infected ants, from which she extracts RNA. Based on the profile of the RNA, she can classify it as either belonging to the ant itself, or to the fungus which has invaded the head. These RNA samples are then sequenced, providing a measure of the quantity of different RNA transcripts, and so allowing de Bekker to look at the level of expression of different genes in both ant and fungus. But these samples would be meaningless without something to compare them to, so de Bekker also sequences RNA taken from healthy ants, as well as from O. unilateralis fungus grown outside a host. She is then able to compare the quantity of RNA transcripts between infected and healthy ants, as well as between fungus grown inside and fungus grown outside an ant. This allows her to see which genes are expressed more (or less) during the parasitic relationship, in both the parasite and the host. It is these particular genes which are presumably vital to the fungus’ control over the behaviour of the ant. One of the most exciting aspects of the crowd-funded model that de Bekker has used is receiving updates throughout the course of the research. And so even though the experiment has not yet been completed, there are some interesting preliminary results. Thousands of genes have been identified which are expressed differently in infected ants and in fungus growing within an ant. Once de Bekker and her team work out what these genes actually code for, we might begin to understand how O. unilateralis creates zombie ants. The post-apocalyptic nightmares of The Last of Us and The Girl with all the Gifts are unlikely to come true anytime soon. But when nature gives us a mind-controlling fungus that can drive a creature to its death and then sprout from its rotting corpse, who really needs zombie fiction anyway?